March Madness betting season is here. It just so happens to coincide with the start of spring. But this year in New Jersey, the NCAA Tournament arrives with a legal sports betting vibe. For the first time, wagering is permitted on the majority of games. The two exceptions are contests involving Seton Hall or Fairleigh Dickinson universities. Any games involving New Jersey schools are off limits, no exceptions. But where to bet is a big decision. Those watching the first two rounds of the big dance from home or the office (we won’t tell) have the option of using any of the 13 NJ sports betting apps. But you can also use those apps while sitting in a comfy seat at an Atlantic City sportsbook. Some are offering free contests specifically geared toward March Madness. 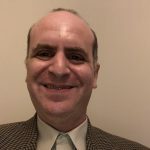 But if being in the center of the March Madness betting action in Atlantic City is more your speed, there are eight retail sportsbooks there, each offering a unique experience. 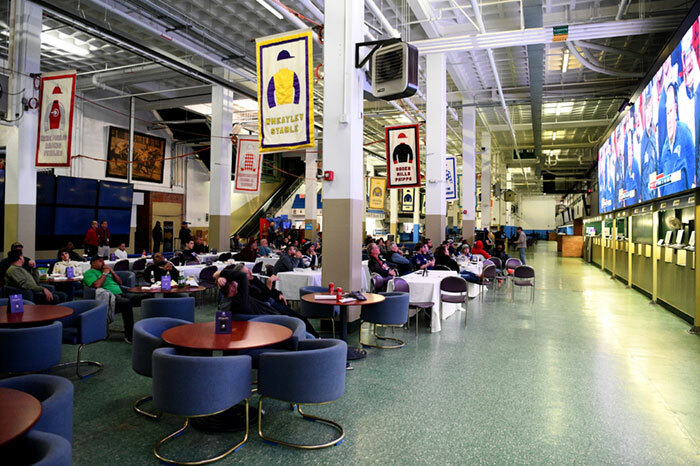 Monmouth Park and the Meadowlands Racetrack have sportsbooks, too. And besides a comfy seat, there are amenities you may not get at home. When it comes to NJ sports betting, FanDuel is the king of the North. 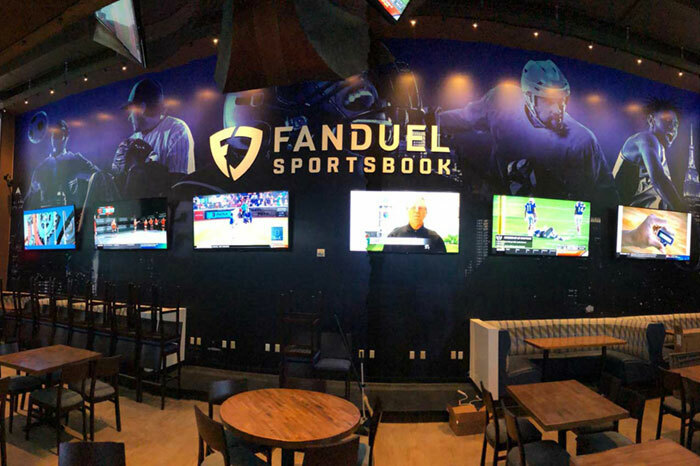 The FanDuel Sportsbook at the Meadowlands is No. 1 when it comes to retail sports betting revenue, too. Besides being the only game in North Jersey, the property is a short drive from New York City where sports betting legislation remains a work in progress. A short trip over the George Washington Bridge or through the Lincoln Tunnel, and suddenly it’s legal to bet on March Madness. Parking is free on any day that there’s no event at MetLife Stadium. At 6,810 square feet, the three distinct location insides the Meadowlands is one of the largest in the state. The area includes couches, leaning rails, high top tables and chairs, and a VIP area. The place holds up to 650 people, but you can reserve a VIP seat by calling 201-460-4079. The 82 TV screens mean there will be no problem showing all the games. The Victory Sports Bar & Club offers classic American favorites if and when you need something to eat. Lines at the betting windows can be a problem, however. But the Meadowlands recently installed 14 IGT PlayDigital’s PlayShot QuickBet kiosks to speed up the betting process. The DraftKings Sportsbook at Resorts is one of the biggest and nicest Atlantic City has to offer. The 5,000-square-foot space is large enough for 300 fans, not including the VIP space that can hold an additional 100 guests. Visitors’ best bet though is to come early to grab one of the stadium-style seats, and sit back and watch all the games on the 15-foot video wall. 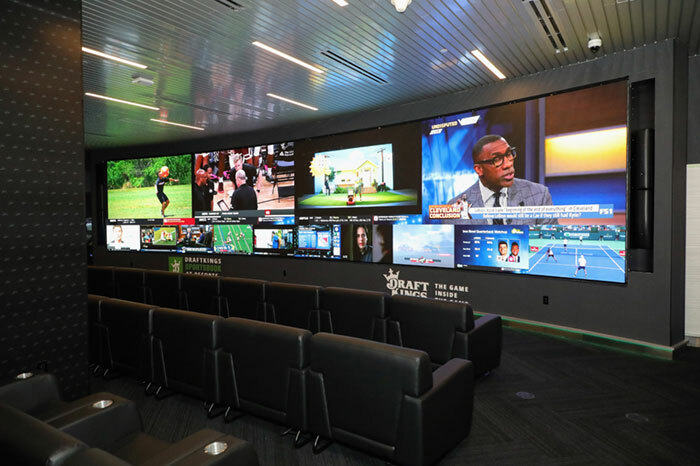 If you want to spring for a VIP space, you can reserve at DraftKings Sportsbook by calling 1-800-772-9000. There are 16 self-service kiosks and five betting windows, so getting that wager in before tipoff will be a breeze. Need more? Food and drinks are available inside the sportsbook, and video poker is available at the bar. March Mania begins with Tuesday’s play-in games between Prairie View A&M and FDU along with Temple vs. Belmont. The former game will be for viewing purposes only. The lineup includes drink specials at DraftKings Sportsbook, Landshark Bar & Grill, and Bar One. When it comes to NJ sports betting, William Hill NJ continues to invest serious money in the AC market. The William Hill Sportsbook at the Tropicana is brand spanking new having just opened on March 8. Talk about perfect timing. 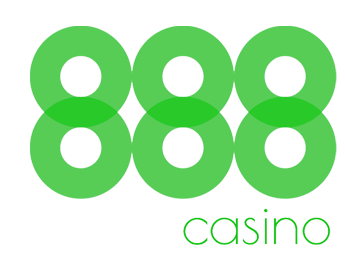 The 5,000-square-foot location is one of AC’s largest, and the 180 seats are the most of any sportsbook in Atlantic City. Seating, however, is first come, first served unless you reserve ahead of time. To reserve on the day of, call 609-340-4022. For groups, call 609-342-7785 and ask for Erin Sterr. Are you worried about catching all the games? Not at the Trop where fans can watch 16 games at the same time. Its space features 1,654 square feet of video display. The sportsbook location couldn’t be better for NCAA Tournament fans. You can bet on the game and then head over to Chickie’s and Pete’s. The popular sports bar is offering an all-you-can-eat package from noon to 4 pm during the first two days of the tournament. Firewaters, Hooters and A Damn Good Sports Bar will have drink specials, too. If Super Bowl Sunday is a sign of what to expect for the first two rounds of March Madness, plan on getting to the William Hill Sportsbook at Ocean Resort early. The 7,500-square-foot space with two bars was so crowded back on Feb. 3 that it was nearly impossible to walk through. So, if you want to watch the games at Ocean, be prepared for standing-room-only or get there early. Why is Ocean Resort Casino’s sportsbook so busy for the big games? Being located in the center of the casino floor likely has something to do with it. The other reason might have to do with its sheer size and amenities. The 360-degree video walls are a nice touch for watching games, whether it be the defending national champion Villanova Wildcats or top overall seed, the Duke Blue Devils. And let’s not forget the enormous odds board. Drinks and small bites are available to order, so there is no need to make a reservation at one of the other on-property restaurants. There are high-top tables and chairs along with some leather seats. The Monmouth Park Sports Book by William Hill was the first of the three to start taking bets way back in June 2018. Located in central Jersey, there are more than 40 HD TVs to catch all of the NCAA Tournament action, including the games involving NJ schools. There are roughly 500 seats in the sportsbook, but all seating is first come, first served. 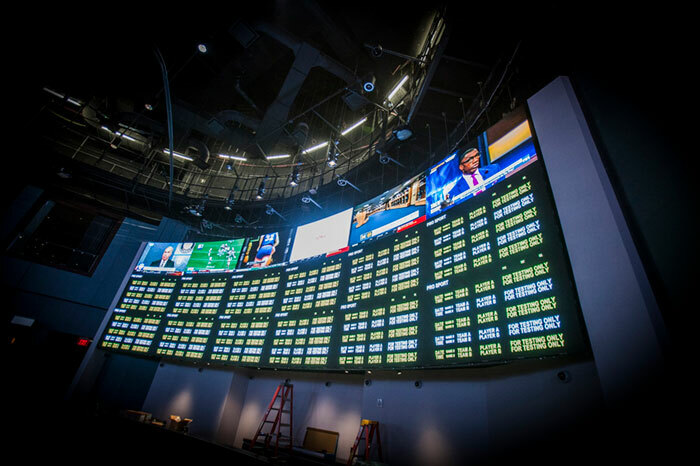 There are 15 betting windows and an integrated sports bar, adding to the full day of college basketball betting. By the way, the sportsbook is opening an hour earlier (9 am) on Thursdays and Fridays. Food and drink specials are available for all the NCAA Tournament games. Golden Nugget is the only one of the three Marina District properties with a permanent sportsbook. That being said, the space is not huge, but there is seating available for more than 100 guests. The 50-plus screens spread across five video walls are a nice feature to the tournament viewing experience. The retail sportsbook is located off the lobby and directly across from the casino floor. Food and drinks can be ordered right from your seat. Borgata will likely have one of Atlantic City’s best sportsbooks for the 2020 NCAA Tournament. But for this season, the temporary race and sportsbook space will have to do. There are 100 seats with individual flat-screen monitors and video walls. 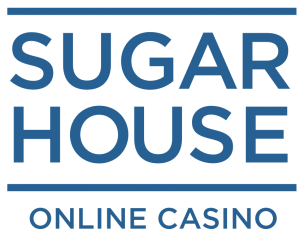 However, Borgata is expecting March Madness betting to attract a big crowd, and the property is getting prepared by adding multiple 10-foot screens in the Central Conference Center that will be open to the public. Guests will enjoy the added amenities of stadium-style food and a full-service bar. Level One will be showing games, too. Combine it together, and Borgata is billing itself as the “ultimate destination” to watch the college basketball championship tournament. We shall see what next year brings. At some point, before the NCAA Tournament comes to a close, the permanent Hard Rock Atlantic City sportsbook is expected to open. The betting windows are open for business, but there currently is nowhere to sit and watch the game. 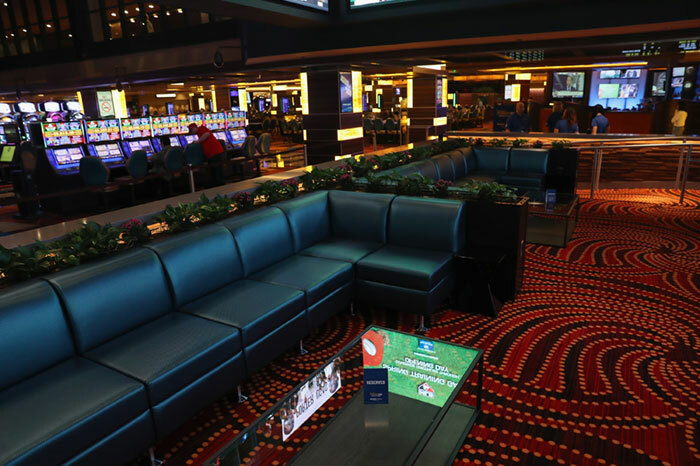 Granted, there are TV monitors throughout the casino floor, and the bars and restaurants will likely be showing the games, too. But if you are coming to town to enjoy the full March Madness betting experience, there are better properties to visit. At least for now. Like Hard Rock, the two Caesars Entertainment properties work just fine for betting, but not necessarily to sit down and watch the games. If smaller is better, the Book at Bally’s Wild Wild West or Harrah’s will suit you just fine. There are eight large-screen TVs and stadium-style loungers along with high-top chairs and tables. If you plan on hanging, food and beverage offerings are footsteps away.